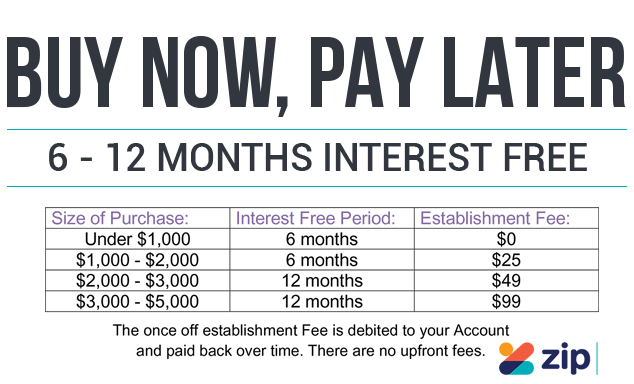 12 Months To Pay Interest Free! 1. 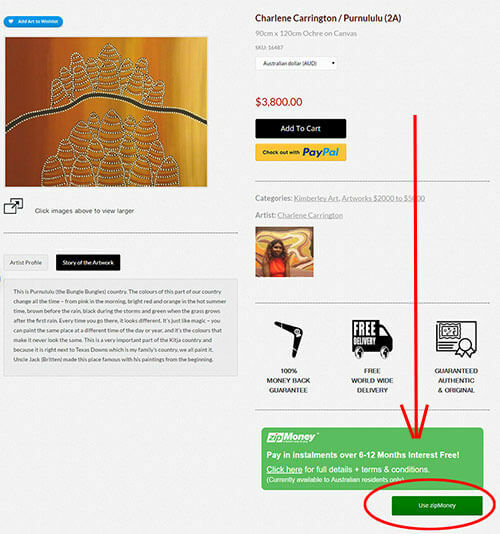 Find the artwork you wish to acquire, then click the green “Use zipMoney” button towards the bottom right of the individual artwork page. 2. Fill in the details on the checkout page. Then click the green “Proceed to zipMoney” button at the bottom left of the checkout page. 3. Follow the steps in the zipMoney process for approval (should take 2-5 mins) and then you will be returned to the Artlandish website. Once approved and you accept the terms and conditions, zipMoney will pay Artlandish on your behalf and your order will be processed and shipped within 24 hours. 1. Click one of the blue “Apply Now” buttons on this page. Create a zipMoney account & follow the instructions given. 2. Apply for an amount that will cover the value of the artwork(s) you wish to acquire. 3. 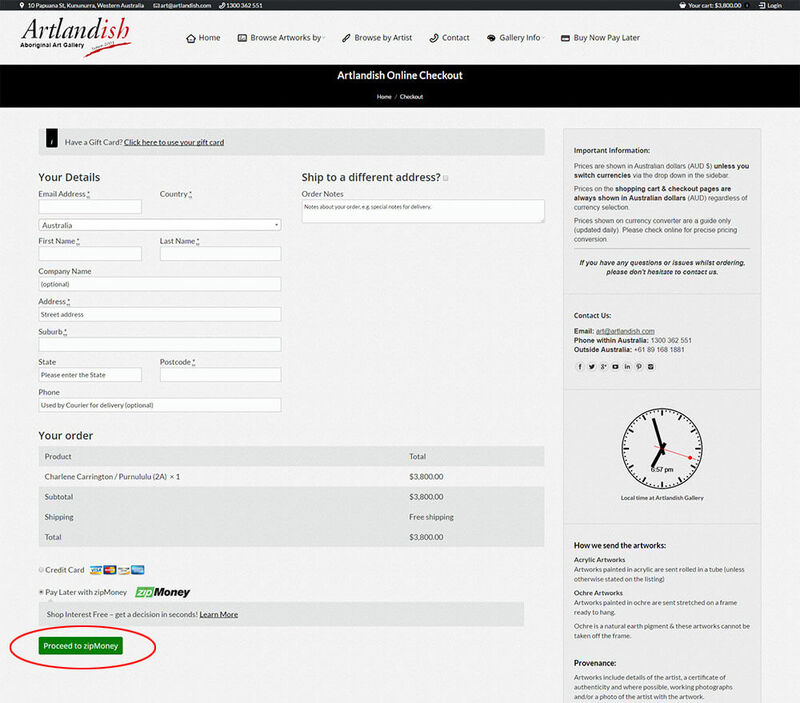 Once approved choose the artwork you wish to acquire on the Artlandish site and click the green “use zipMoney” button. 4. 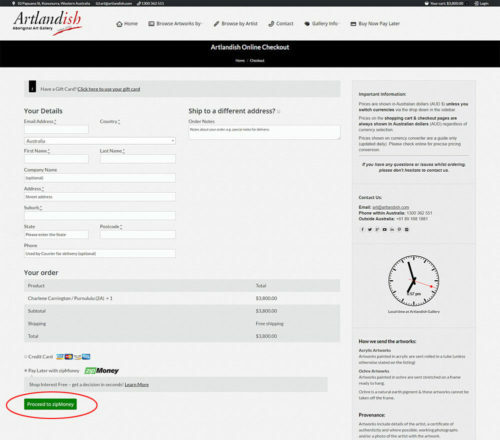 Fill out your details on the checkout page and then click “Proceed to zipMoney” and confirm your order. What about purchases totalling more than $5,000? You can still make a purchase above $5,000 and use zipMoney. If for instance the artwork you wish to buy is $6,500, you can checkout using zipMoney and you will apply for the $5,000 limit. 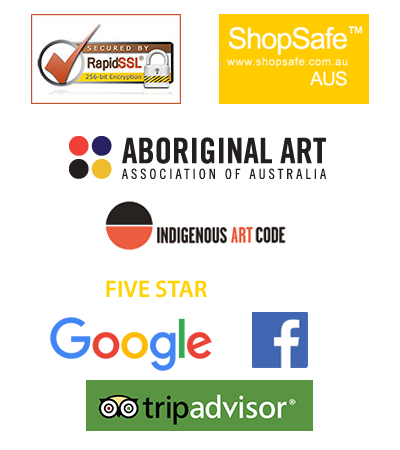 Once approved you will then be given the opportunity to pay back $5,000 of the $6,500 artwork via zipMoney’s instalment payments with 12 months interest free and you will be required to pay$1,599 upfront to cover the difference. The $1,599 is made up of the $1,500 difference between the price of the artwork and the $5,000 limit available with zipMoney + the $99 establishment fee which would usually be absorbed into the monthly zipMoney payments but as you are being given the maximum amount of credit, in this instance it will need to be paid up front along with the difference in price.